My 8 year old nephew helped me assemble this easy lunch. He asked me to title it “Animal Face”. My nephew decorated this lunch with my animal pick collection. This was a lunch at home so no need to think about what other little boys would say. 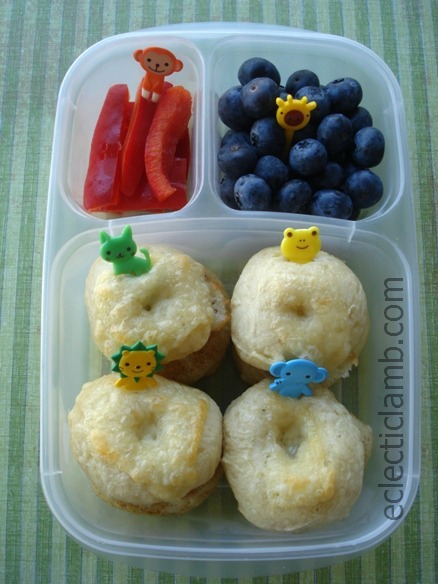 This entry was posted in Bento / Cute Food and tagged bagel, bento, vegetarian. Bookmark the permalink. Thank you! Picks are fun and easy to use. Peer-pressure over lunch; I hear it from my grandson.You have to wonder, huh? The picks are darling.I am glad your nephew appreciates your work! Thank you. My nephew loves my lunches and we have a great time creating together. Yummy! The little bagels are so adorable! great excuse to make and eat bagels!!! !